The giveaway has ended, and we have 18 WINNER WINNER CHICKEN DINNERS! Were you one of them? Watch this video to find out! Remember last week when I told y’all there was a BIG giveaway coming?? Well, today is the day! In honor of Cyber Monday, Santa is delivering a big bag of our favorite things to a whole bunch of YOU. I’m teaming up with two of my favorite bloggers–Dusty from All Things G&D and Katie from Bower Power–to bring you guys an EPIC giveaway that is chock full of goodies. Since we have so many items up for grabs, we’re calling it Santa’s Showcase Showdown! Bob Barker would think this prize is right, y’all. I could not be more excited to get this giveaway started, so let me kick off the festivities by introducing the items in my Showcase. 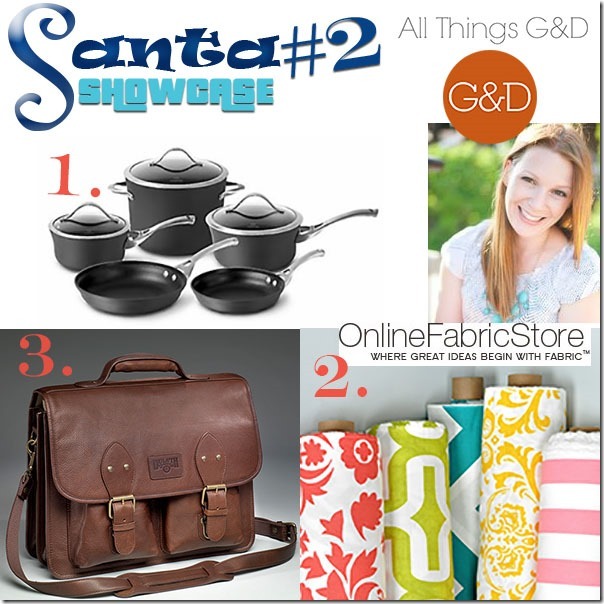 The first showcase up for grabs features some of my most favorite things in the whole entire world! 1. One Nutri Ninja® | Ninja® Blender DUO™: I use my Ninja blender nearly every single DAY, y’all! I have talked about my love of my Ninja in numerous blog posts, but let me say again just how much I.LOVE.IT. This blender can turn ice into snow, and shred blocks of cheese in seconds. I make smoothies and milkshakes and all sorts of goodness inside my Ninja. If you don’t have one on your wish list this year, it needs to go straight to the top! 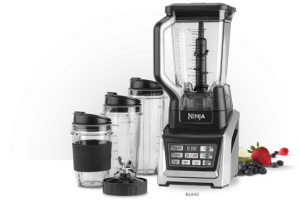 For this giveaway, one lucky person is going to win the new Ninja Nutri Blender with Auto IQ technology. Clean off some counterspace, because you are going to LOVE it! 2. 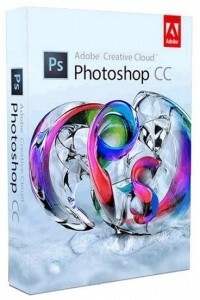 Two Adobe Creative Cloud Photography Plan Annual Subscriptions: There are quite a few things in my life that I could not live without, and Adobe Lightroom and Photoshop are in the top ten. I use these two programs for every single blog post that I write. There is not a day that goes by that I don’t find myself editing a batch of photos or adding watermarks to my pictures. I have shown you guys how to straighten photos in Lightroom, and how I edit my interior photography using Lightroom. 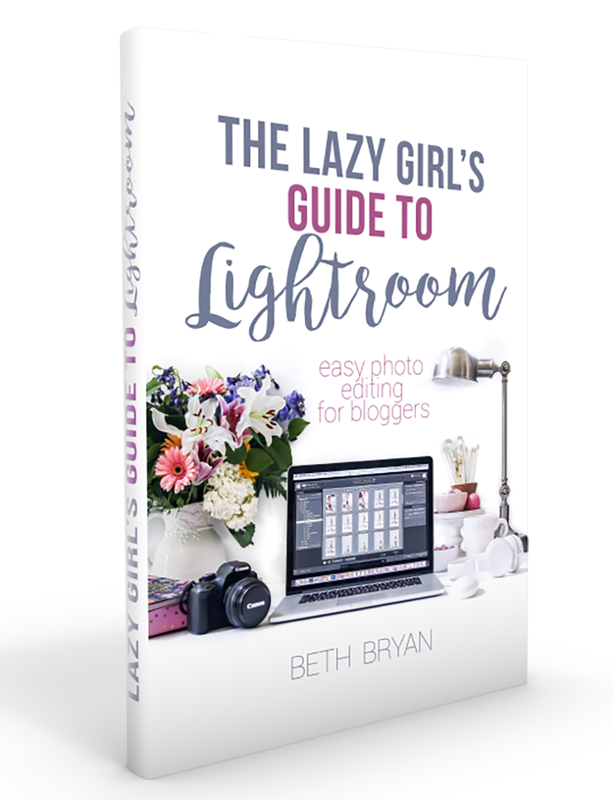 Today, TWO people are going to get the chance to win BOTH PHOTOSHOP AND LIGHTROOM FOR A YEAR!! Ahhhhh this is SUCH a sweet deal! Adobe now offers their software as a monthly or annual subscription via their Creative Cloud Photography Plan. When you look at the price of full blown Photoshop it makes total sense to me to pay for a monthly subscription for this service. Today, two lucky winners will gain access to the Creative Cloud Photography Plan for an entire year! Woot! Good luck you guys! 3. One Copper River Bags Safari Napa Camera Bag in Bourbon: (Sorry, camera not included) In every single travel or vacation photo I have taken for the past two years, you will find my Copper River Camera Bag strapped across my body like a Rambo bandoleer full of ammunition. I wear this bag more often than I wear pants, and that is no joke, people. It is my most favorite accessory. It is the perfect size– not too big and not too small. It’s just right. It holds a deceptively large amount of junk. I had so much stuff packed into this bag on our Disney trip last week that the airport security scanner couldn’t believe his eyes when he performed my bag check (never fails, I get a bag check.) I should write a post about what all I can carry inside this bag, because you would be amazed. As a bonus, every single time I go out in public with it, someone comments on what a beautiful bag it is. My husband has the 17″ distressed leather laptop bag, and the same thing happens to him when he carries it in public. People literally stop me on the street to rub on it and say how gorgeous it is. Then they regret commenting on it because I launch into a 10 minute spiel about Copper River Bags and their 100 year leather lifetime warranty and how they are hand-made in the USA by some awesome folks out in California. Those same people who have been nice enough to give me a gorgeous Safari Napa Camera Bag with a leather strap to give away to one EXTREMELY lucky person in this giveaway! I hope you wear this bag with pride like I do, and never leave home without it. (As an interesting side note, the Copper River diaper bag that I gave away last year holds the record for the most entries I have ever received on a single giveaway item. Everybody wants one of these bags!) In other words… it’s worth entering this entire giveaway just for this bag alone! 4. One Silhouette Portrait Machine: Oh, Silhouette, how you’ve stolen my heart in such a short amount of time. As soon as I got the software hooked up and the machine cutting (which was way easier than I thought it would be) I was hooked. I have been using the competitor cutting machine for a few years, but it was SO limited in what it could do. After just one night with my new Silhouette Portrait machine, I was completely converted. The fact that I am able to purchase pre-made designs from their shop for just .99 cents instead of paying $40 for a cartridge full of cutouts that I may or may not ever use was WAY appealing to me. I also loved the way I could cut out almost 100% of the paper instead of being limited by what the machine would allow. The crafty mama in me cannot wait to use this machine for Garrett’s birthday party decorations in February! If you’ve been wondering if the Silhouette machine is worth it, let me be the first to tell you YES. If you have a scrapbooker or crafty person in your life, this machine is the perfect gift for them! There are some amazing Silhouette Black Friday/Cyber Monday sales still happening right now on both the Portrait and the Cameo, so be sure to go check out the offers! Use code BOPPY for the Cyber Monday deals! (In case you’re wondering, the Portrait has an 8″ cutting mat and the Cameo has a 12″ cutting mat.) But this week? One extremely lucky person is going to win a Portrait machine from Silhouette! WOOTWOOT! Ok, that is it for my showcase of stuff! Next up? Santa Dusty from All Things G&D! 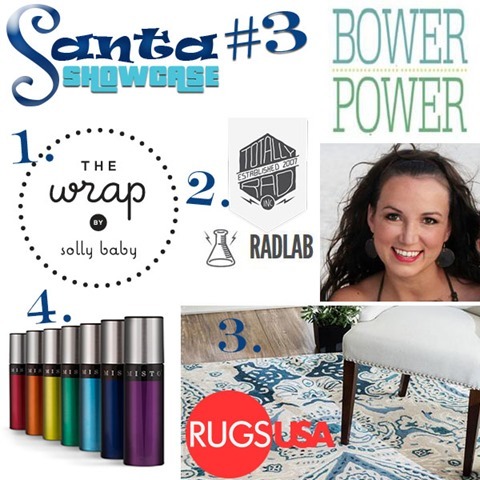 Go visit Dusty’s giveaway post to hear how much she loves the items in her showcase today! And finally, Santa Katie from Bower Power has an AWESOME showcase filled with amazing prizes! Click over to her Showcase to read all about the fabulous prizes she is offering today! Alright you guys… 18 awesome prizes means 18 winners for this EPIC giveaway, so get those entries in NOW! PS: Don’t forget, this week kicks off the Christmas decorating mania here on the blog! Tomorrow I’ll be sharing my Junkers United Christmas decor, and on Wednesday you’ll get the full house tour since I’m Stop 18 on Jen Rizzo’s Holiday Housewalk! Be sure to check back if you need some Christmas decorating ideas. I’ve got lots and lots headed your way! Oh, my ladies…the things you love are awesome – this is an EPIC giveaway! I’d so love the Silhouette – I’ve heard so many wonderful things about it! My sister has a Ninja – we used it and I fell for it…so many awesome things here – so hope I win 😉 Thank you for hosting this giveaway! All wonderful prizes!! Thank you for the great giveaway!! WOW! What a give-away! Love the leather! Fabulous giveaway! I could definitely share lots of these goodies with my family and friends. I know I should not think this way because a kajillion people will enter this, but no bunch of prizes have ever been more perfectly chosen to be mine. These are all things I have been dreaming about lately! You have done a splendid job with showcase #1! Why didn’t I tell my kids I wanted one of those Ninja’s for Christmas? Maybe cuz I’m gonna win one at Beth Barkers house. 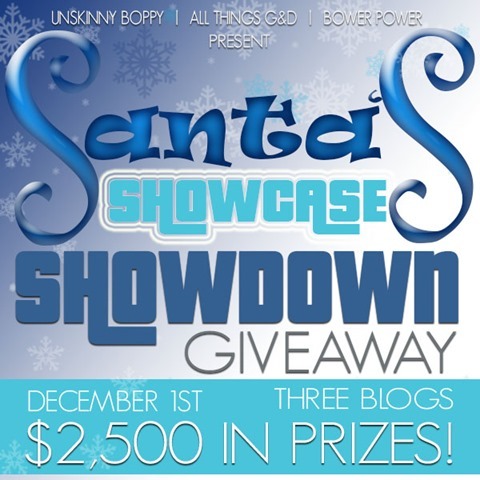 I think this is the most amazing blog giveaway I have ever seen!!! Crossing my fingers and thanks to all for the chances. What an amazing giveaway! I would go nuts for the Silhouette and the awesome camera bag! What great prizes! I would LOVE to have that Silhouette! Such a great giveaway! I would love a subscription to the Creative Cloud. WOW. you really know how to do a giveaway.Thanks to all the sponsors and the chance to win. So fantastic! A perfect combination of products. Thank you! Girl! You know I need that bag!!! Would love to win this. So many awesome prizes. Love the Giveaway! A Ninja would be nice. I love my Ninja, but could use a new one!!! Thanks so much for thegiveaway! I’d love to learn how to use these for photos!! Would LOVE to win any of these wonderful prizes!! thanks for the opportunity! wow ladies! these are some amazing giveaways! am I the only one who doesn’t understand this Rafflecopter? I entered my email but now I don’t see where to “enter” the drawings. And it indicates I have zero entries… help anyone? The camera bag would be the perfect gift for my mom!! 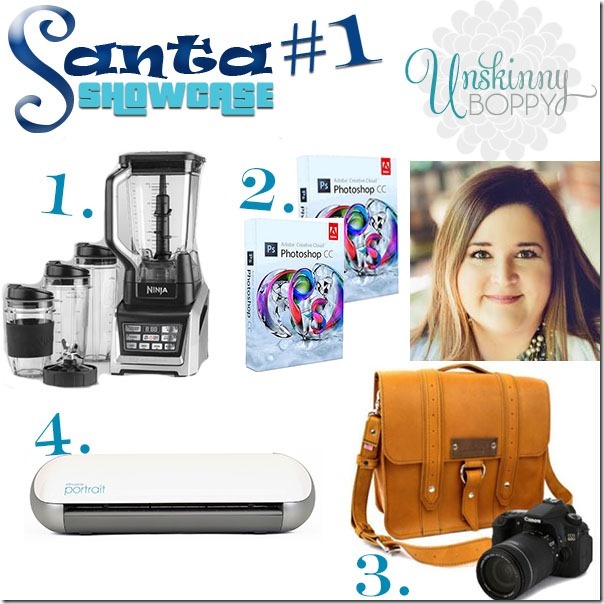 I hope I win any of these lovely things! Christmas coming early!!!!!!!!!!!!!! What an amazing giveaway! I have loved following your blog, Unskinny Boppy. 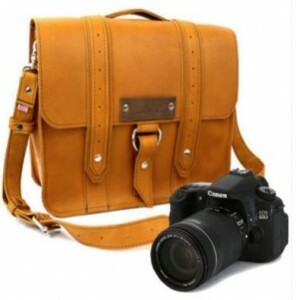 I love that beautiful camera bag! And the Silhouette is amazing! I love everything in Showcase #1. Great job selecting products. Love the giveaway, so many great prizes. Thanks! I soooo want to win that magical camera bag! What a fun giveaway!! And now I have a new blog to follow. How wonderful! Great giveaway, thank you so much for the opportunity. I don’t really expect to win anything, but I do admire the generosity. These are some wonderful gifts to give away at Christmas time! I could do some many things with that Silhouette and the Ninja! They would make my Christmas gifts pop and my cooking so much fun! Wow! Just Wow! Great give away and Merry Christmas everyone. This is an epic giveaway thanks for the chance. I would love a silhouette they look so cool!